Mama of 10 : Confessions! Notice all the "sometimes" in the above confessions? "Sometimes" is such a relative term :o) That's why I like to use it. I just wanted the few of y'all that read my blog to know that I am far from perfect. I do try to focus on the positive in this blog, but we have many faults and thank the Lord He does not give-up on us. My wise husband is always reminding me that raising 9 kids isn't easy, but it is so rewarding. Like last night he asked me, "Did you think raising teenage boys would be a piece of cake?" I had to honestly answer that I hadn't thought about that when they were toddling around in their Jon Jons. They are great boys though, and I know I need to keep my eye on the big picture. Happy Parenting! thank you for that. i appreciate your authenticity. for some reason, this post helped me. :) God bless you! Wonderful post! I'm finding the teenage years challenging at times too. Thank you for your honesty. Your words are an encouragement. I do all 5 also...except the fast food. I let my kids eat it sometimes..but I can't. I just can't. 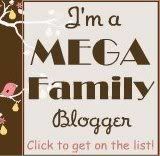 I'd rather have the expensive coffee...love your blog! I can't imagine how you do it (and do it so well)! It must be an anointing from the Lord.